Lou is a chef with her own restaurant, Louella’s, eeking out a living in Milwaukee. She works hard and loves her work, something her fiancé Devlin, a high-powered attorney, doesn’t understand. She’s somewhat content with life, until she finds Devlin in a compromising position with a paralegal–it throws off Lou’s entire day and she has a wreck of a night at her restaurant–serving a botched meal to an undercover food critic. Al Waters is a London transplant whose scathing food reviews have earned him some fan mail, but few friends. His experience at Louella’s is positively sickening, and he’s not willing to give the chef another chance to poison him. His review is the beginning of the end for Louella’s, and rightly so!–in his opinion. Serving undercooked fish is a health hazard…. Al meets Lou at a bar where she’s gone to cry out her sorrows–and they hit it off. Neither of them want to talk about work, but Al’s complaints of the city Lou loves earns him a bona fide tour guide–she wants him to love Milwaukee before he leaves it. Thing is, Al starts falling for Lou, and she for him. Neither is really ready to commit to anything–Lou has a restaurant falling apart and Al wishes for bigger cities/writing markets, but their bond is developing. Until Al realizes who Lou is, and how his article killed her restaurant and dreams–and he’s sick over it. He tries to make amends, but can’t. He tries to walk away, and can’t. So he does the only thing he can do–support Lou through it. And fall in love. It’s not a one-sided affection. Well, until Lou learns who wrote her restaurant’s review, that is…. This was a really sweet story with plenty of heart and well-rounded characters. Lou is a beloved person and chef who had a really really bad day–and she triumphed within her loss. Al was an uptight jerk who melted in Lou’s capable hands. He secondary characters are very well-drawn and add a good deal of seasoning to the story. Plus, the love of Milwaukee just pours off the page. I’m a Chicagoan, and this book made ME start to love Milwaukee–a true feat! I really enjoyed the tour throughout the city, and the fun cooking bits and pieces. I honestly would have loved it more had there been any physical heat on the page, but the book is cleaner than my empty dishwasher. Alas. Still, it’s a quick read with emotional depth and a few quick twists that kept the story moving. Lots of great tension regarding how and when Lou would find out Al’s deception. I wasn’t shocked by the bearer of this bad news, and really liked that Lou didn’t ever give up or cow to the whims of people who didn’t keep her best interests at heart. She’s a great character, and the coconut cake recipe at the end made for a sweet finale. Interested? 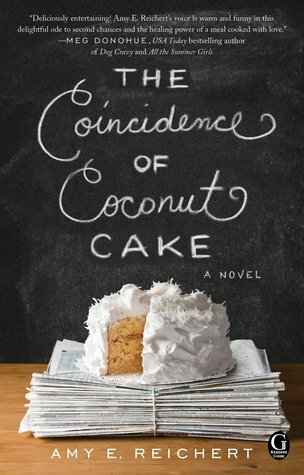 You can find THE COINCIDENCE OF COCONUT CAKE on Goodreads, Amazon, and Barnes & Noble. I received an advance copy of this book via NetGalley. Find Amy online on her website, Goodreads, twitter and Facebook.